In the 1920's there were three mills in the townland of Straw. These were all on the same road so locally it was known as the 'Milltown Road'. Recently the name has been changed to 'River Road'. The first of these mills belonged to Mick Crilly. It was the corn-mill and saw-mill. The two mills were under one roof but had two different leads. The wheel for the corn-mill was on the outside and the saw-mill wheel was on the inside. The Mill race came from the Whitewater River and could be diverted from one wheel to the other. The second mill was owned by Barney Donnelly and it used the same race to operate a flax, saw and corn-mill. 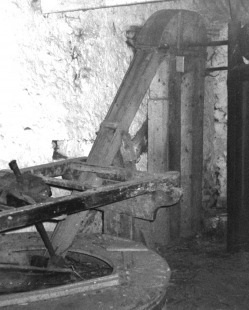 The third mill, which belonged to the McIvor , used a 'carry' from the Moyola River to operate a flax-mill only. I have a special interest in the mill known as 'Crilly 's' because in the early nineteenth century this mill belonged to my family. The name of the owner was Joe Kelly and he was my grandfather's great-grandfather. There is a story told that this Joe Kelly once rode to Dublin to consult Daniel O'Connell on a legal matter. In exchange for his legal advice, Daniel O'Connell's cloak was dyed at Kelly's mill. 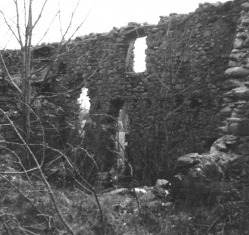 The ruin of the kiln at the Kelly/Crilly mill. Millstones: The lower stone was fixed - the ‘bedstone’. The upper stone rotated. Middle wheel - Internal water-driven wheel. Cogged wheel or trundle wheel. The Kelly (now Crilly) mill building; the water wheel is at the far end of the building. The mill race for Kelly/Crilly mill running past the yard wall of Straw school. Millstones; the 'shoe' is on the left. Fan - which separated seeds from hulls. 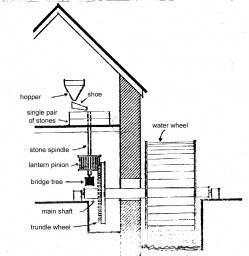 Lantern pinion; this converted vertical power from the water wheel to horizontal power for the turning millstone. Saw-mill wheel. Wooden rollers helped to move logs. The trade of the corn-mills in Ulster was greatly increased during the Napoleonic Wars because the British ports were blockaded, and there was more demand for Irish oats, wheat, oatmeal and flour. Later the coming of the Great Famine forced the government to repeal the Corn Laws which had banned the import of ready-milled grains. The lifting of this ban had a bad effect on many small mill as more and more grains were imported from abroad. However, the two corn-mills in Straw survived through local trade and both were in operation in the 1920's. In fact Crilly's still operated a corn-mill until the early 1950's. The mill race was formed by the construction of a 'carry' or barrier across the Whitewater River, approximately half a mile above the mill. This barrier was originally made with oak beams and filled with large stones. At a later date this was reinforced with concrete. Some of the water was diverted to flow down a man-made channel (race) to the mill. At the head of the race a wooden board was placed across it to regulate the flow of water so that no more than nine inches of water could get through. This was to protect the local farms from flooding. Just before the race reached the mill a dam was formed so that water could be stored for dry weather. The flow from the dam could be channelled into either wheel or released, through a sluice gate, to by-pass the mill wheel entirely if required. 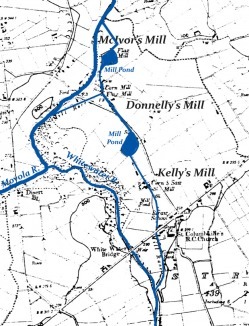 A second dam was formed below Crilly's mill. This was to store water for the operation of Donnelly's mill. 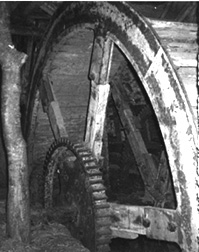 The mills worked from the 1st of October until the 12th of May. They were open six days a week and when they were busy they would grind corn at night and use the scutch and saw-mills during the day. The local farmers paid the miller by means of a 'meuter', i.e. a proportion of the flour milled. The system was open to abuse on both sides. There were two main types of corn milled in Straw: they were known locally as 'sandy' corn and 'old sandy' corn. The corn was first taken to the kiln where it was dried on a 'wire-head'. It had to be turned frequently to keep it from burning. Each mill had its own kiln. When the corn was dry it was taken to the mill. The sacks of corn were emptied into the hopper and fed down through a wooden chute or shoe into the the first set of mill-stones. This first process was called shelling or, locally, 'shilling'. It involved the removal of the outer casing or shell from the kernel of the grain. The 'shillings' were used to make 'oat sowings’, a type of porridge popular with local people. The dust extracted in the shelling process was boiled in a ten gallon pot or mixed with meal to be used as food for animals. The husks from the grain were also used to fire the kiln. The seeds and hulls were separated from the dust by means of a dust sieve and were then fed into a wooden box containing a fan. This separated the lighter seeds from the hulls, which were heavier. Finally the kernel of the grain went on to be ground again on the 'grinding stones'. These were set much closer together than the shelling stones and therefore gave a much finer meal. The finished product was then passed through a finer sieve to remove all impurities.